How did a skeleton ever get so muscular, anyway? I know, it’s weird. Why is only his head a skeleton while the rest of him is so fleshy? Maybe he’s infected with a very, very, very, very, VERY slow flesh-eating bacteria that just hasn’t worked its way down yet. The Awesomenicity of this SOD goes to 11. I don’t know … I always thought Jack Palance looked like a real world Skeletor. 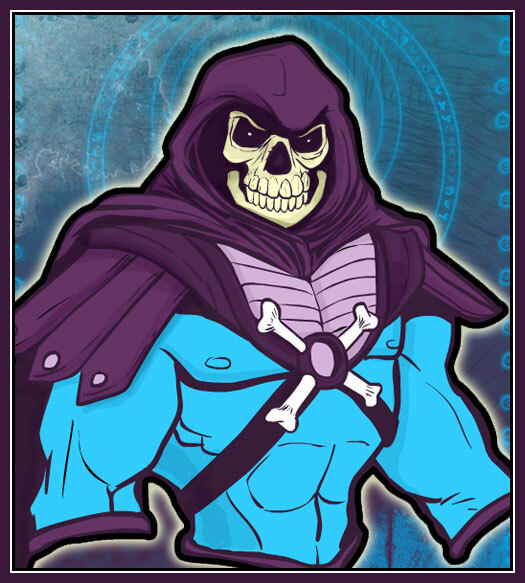 Loving all the Masters of the Universe art Jeff, and Skeletor looks great!! Well in the new Masters mythos. Keldor who was fatally wounded in battle, was saved by Hordak, who merged him with a demon called Demo man, turning him into Skeletor, the Evil Lord of Destruction. (Just wanted to explain the skull look). Skeletor was once a man named Keldor, though no familial connection to Randor is ever openly established. Nevertheless, the audio commentary on the first volume of the DVD release of the 2002 series states that Keldor/Skeletor is indeed Randor’s half-brother. A great villain wasted on a really stupid cartoon.